They require no special care other than routine hygiene. 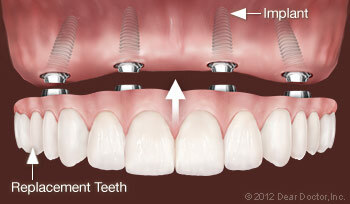 Dental implants function primarily as the roots for replacement teeth. A cylindrical titanium post is screwed into the jaw bone getting a firm support from it. Further, they encourage bone cells from the jaw to grow into the metal surface (osseo-integration) making a very strong natural bond with jaw bone. Thus the implant is as good as the natural root of a tooth. To this root is attached a natural looking crown (the visible part of a tooth). Alternatively, two or more implants may be used to support a complete denture. 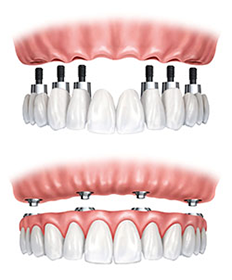 A denture supported by implants is fixed and looks and functions like a natural set of teeth. The implant procedure is rather simple and is carried out in the dental office. It is always preceded by a thorough examination and assessment to determine the suitability of implants. In case the patient does not have sufficient bone in the jaw to support the implant, bone grafting may be done. If any existing teeth have to be removed, those are removed. The implant procedure is normally done under local anesthesia. The traditional practice of implants waited for the gum to heal after extractions, but same day implant procedures are now becoming popular. It is usual to wait for osseo-integration (two to three months) to take place before loading the implants (attaching dentures on them) but temporary teeth may be attached the same day. The decision to ‘load’ the implants the same day or wait will depend on the merit of the case. The same-day procedure may take one to three hours depending on the number of implants needed. Post-operative discomfort, if at all, can be managed with over-the-counter anti-inflammatory medication like ibuprofen or acetaminophen. Immediately after the implant procedure, you need to be careful in eating till osseo-integration is complete. A soft diet will be recommended, avoiding hard foods. Having to wait for about three months makes one uneasy, but after that period, no special care is needed as is needed in case of conventional dentures.